An award winning Student Ambassador, a Warden and a member of two societies, Emmanuel has thrown himself into LSBU life. "I was born in central London and didn't want to study anywhere but home. LSBU has the best Accounting and Finance course so it was a no-brainer to come here. The thing I most love about LSBU is the diversity – there are students from all walks of life here and I've met some amazing people. "As soon as I started at LSBU I knew I wanted to get involved in all the opportunities that were available – and the same went for my internship. At first I wasn't sure if an internship based where I study was a good idea - I wasn't sure if amassing all my experience at LSBU would give me well-rounded experience. But I quickly realised this wouldn't be the case!" 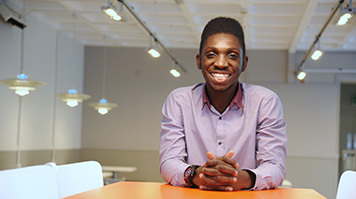 Emmaunel and four other accounting and finance students spent nine weeks in the financial department at LSBU and rotated areas such as payroll, financial planning and procurement. "Having the opportunity to experience all the different aspects of finance was brilliant and really helped me work out what I enjoy. We also got the opportunity to visit top accountancy firms and speak with external companies, we had coaching sessions and spent time planning and presenting our own project. "The internship was so well-organised and thorough, putting the student at the heart of the process rather than getting us to do the donkey work. From my time in the finance department I discovered I really enjoy procurement and discovered just how important building a relatnionship with suppliers is." Emmanuel is about to enter his third year of study and is already planning what to do when he graduates. "My course is catered to things you'll do in the real world, and the internship has gone even further in giving me that tangible experience. I plan to apply for graduate schemes at places like BP, Standard Life and HMRC – and hope to fit in some travelling at some point too. I really want to go to Thailand!"